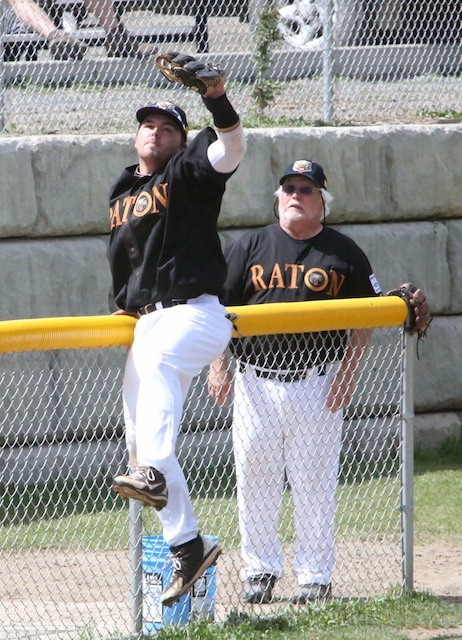 RATON � Rain flooded Gabrielle Park in Raton Friday, forcing the first rain out of the 2013 Pecos League season. 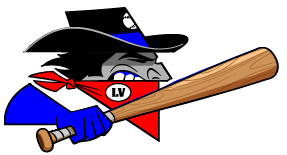 But the Osos and Train Robbers got back at it early Saturday morning, playing a double header that saw Las Vegas sweep both, winning the morning game 10-7 and the nightcap 19-10 to even their record at 5-5. In Saturday�s opener, a big first inning for the Train Robbers made all the difference. Oso starter Brian Hicks faced 11 batters in the top of the first, giving up seven runs on six hits, including a lead-off home run by Matt Grosso and a 2 RBI dinger by Will Walsh after Randy Wells singled. Ricky Brown, Joey Haskell and John Hotta also singled and Hicks walked two. But after that, the game was a lot closer. Raton put one run up in the bottom of the stanza when Stedman Smith, Wayne Lewis and Matt Lynch all walked off Vegas starter Greg Fowler, then Smith came home on a balk. Hicks shut the Train Robbers down in the second and third then the Osos closed the gap to 7-3 with two in the bottom of the third. Wayne Lewis doubled and came home on a pair of outs, then A.J. Doyle homered. Las Vegas got those runs back in the top of the fourth when Wells walked and Walsh brought him in with his second home run of the night. Raton closed to within two in the sixth on their biggest inning of the day. After Doyle was hit, Zach Kreegar homered to make it 9-5. Brian Gregory then singled and Ryan Barban walked, they advanced on another walk and came home on a Lynch single. But that was all the Osos could muster for the rest of the game, and the Robbers added a final run in the seventh on a Grosso single, wild pitch and Walsh sac fly. Game 2 started out fairly close, but what Dill called �explosive� offense put Las Vegas on the board in every inning of the seven-inning game. Vegas put two on the board right away after Hotta singled, Wells was hit and Welsh tripled them in. An error and one out later, Alexander singled in Walsh then a walk, a single and a hit made it 4-0. The Osos scored two in the bottom of the stanza when Smith doubled and scored on a Lewis single, and Lewis came in on two Robber errors. Las Vegas got two more in the second when Wilson hit a two-run home run, and three in the third on a three-run banger by Wells, but the Osos had their big inning in the bottom of the stanza. With one out, Lynch doubled and came in on a Lange home run. 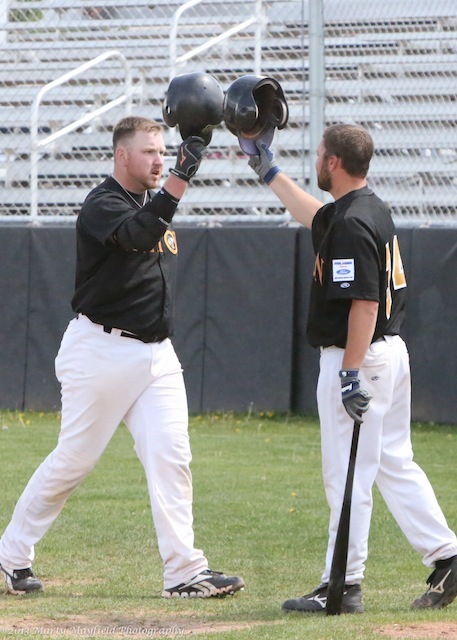 Kreegar singled, Doyle advanced on a fielder�s choice and an error then came home on a Nicholas Honojo single. Raton got the fifth run of the inning on a Willie Frederick tripe. 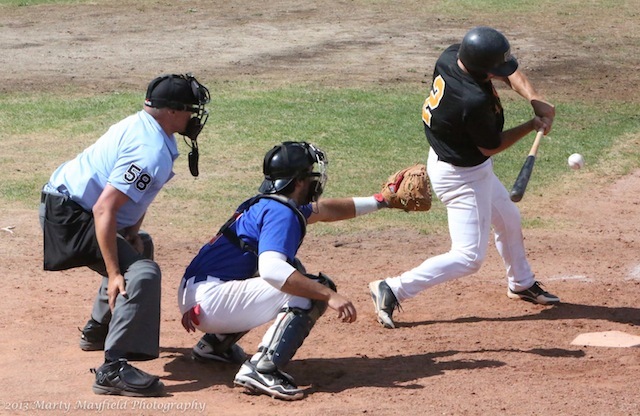 That closed the gap to 9-7, but while the Osos scored one each in the fourth, sixth and seventh innings, Las Vegas picked up another four in the fourth � another Wilson home run helped � one in the fifth, four in the sixth and one in the seventh. Dill is happy with how his team is performing. They�ll try for a sweep of Raton beginning at 7 p.m. at Gabrielle Field.